SAN ANTONIO, Texas—A Texas farmer who helps to satisfy America’s sweet tooth took home the top prize in the Texas Farm Bureau’s (TFB) 2013 Outstanding Young Farmer & Rancher contest. Sugarcane farmer Sam Sparks, 33, and his wife, Shannon, were chosen over two other finalists today at the 80th TFB Annual Meeting. Sparks faced fellow runners-up Andy and Morgan Boyd of Lamesa and Cade and Jessica Richmond of De Leon. Sparks is one of only about a hundred sugarcane growers in the Lone Star State. He and his wife also grow cotton, corn, grain sorghum and soybeans in the Harlingen area. They also raise Registered and Commercial Black Angus, Brangus and Brahman cattle. Sparks brought soybeans back to the family farm and utilizes new technologies to ensure he’s getting the most out of his planted acres. He has also set up retirement plans to retain and recruit employees. The Sparks have two daughters, Evangeline (Eve) and Mason (Mae). As winners of the statewide contest, the Sparks will receive: a $5,000 cash award, courtesy of Farm Credit; the title to a 2014 3/4 ton 4x4 Chevrolet pickup with a diesel engine, courtesy of Texas Farm Bureau Insurance Companies; 100 hours of use on a Case IH tractor from 60 HP-140 HP, courtesy of Case IH; a $1,000 service voucher, courtesy of Chevrolet; and a plaque and belt buckle representative of the award. The Richmonds and the Boyds each will receive: a new pair of Justin Boots, courtesy of Justin Brands, Inc.; a power tool valued at $200, courtesy of Grainger; a $500 cash award, courtesy of Louis Dreyfus Commodities; and a plaque and belt buckle representative of the award. The Sparks will go on to represent Texas at the American Farm Bureau Federation (AFBF) Annual Meeting Jan. 12-15, 2014 in San Antonio. The winner of the Achievement Award will get their choice of a 2014 Chevrolet Silverado or a 2014 GMC Sierra, courtesy of GM. 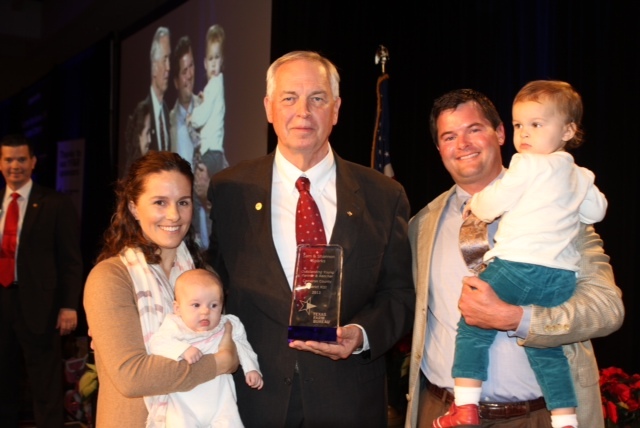 The winner will also receive paid registration to the 2014 YF&R Leadership Conference in Virginia Beach Feb. 7-10. The three national finalists will receive a Case IH Farmall 65A, courtesy of Case IH; and a $2,500 cash prize and $500 in STIHL merchandise, courtesy of STIHL. Media outlets: For high-resolution images, please contact Jessica Domel at JDOMEL@TXFB.ORG. 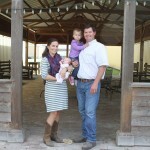 Sam and Shannon Sparks of Harlingen have won the 2013 Outstanding Young Farmer and Rancher contest at TFB's 80th Annual Meeting in San Antonio.